Detail of a suspended votive crown from Visigothic Spain, before 672 AD. Part of the Treasure of Guarrazar offered by Reccesuinth. Out of view are chains for suspension above, and a Byzantine pendant cross below. Alternate view. 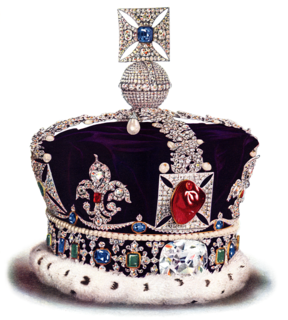 A votive crown is a votive offering in the form of a crown, normally in precious metals and often adorned with jewels. Especially in the Early Middle Ages, they are of a special form, designed to be suspended by chains at an altar, shrine or image. Later examples are more often typical crowns in the style of the period, either designed to be placed on the head of a statue, or re-used in this way after donation. A votive offering or votive deposit is one or more objects displayed or deposited, without the intention of recovery or use, in a sacred place for broadly religious purposes. Such items are a feature of modern and ancient societies and are generally made in order to gain favor with supernatural forces. Historians typically regard the Early Middle Ages or Early Medieval Period, sometimes referred to as the Dark Ages, as lasting from the 5th or 6th century to the 10th century CE. They marked the start of the Middle Ages of European history. The alternative term "Late Antiquity" emphasizes elements of continuity with the Roman Empire, while "Early Middle Ages" is used to emphasize developments characteristic of the earlier medieval period. 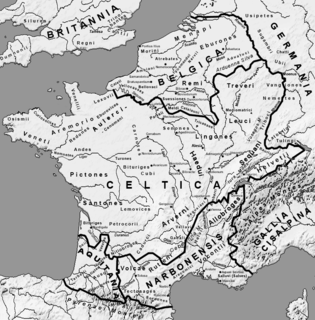 As such the concept overlaps with Late Antiquity, following the decline of the Western Roman Empire, and precedes the High Middle Ages. There were pagan votive crowns in the ancient world, although these are essentially known only from literary references. Vitruvius records that when Hiero II of Syracuse (died 215 BC) suspected his goldsmith of cheating him over the making of a votive crown for a statue in a temple, for which he had supplied the gold to be used, he asked Archimedes to devise a test. 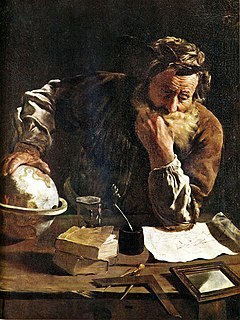 This led Archimedes to his famous eureka moment, after he realized he could test the crown by comparing its displacement of water to that of the same weight of pure gold; in fact the goldsmith had taken some gold and added silver instead. From other references, it seems that in classical times not just statues of the gods, but also living rulers were presented with crowns in the hope of a favourable response to a request. Marcus Vitruvius Pollio, commonly known as Vitruvius, was a Roman author, architect, civil engineer and military engineer during the 1st century BC, known for his multi-volume work entitled De architectura. His discussion of perfect proportion in architecture and the human body led to the famous Renaissance drawing by Leonardo da Vinci of Vitruvian Man. 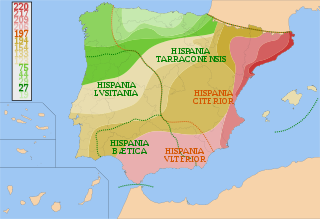 Hiero II was the Greek Sicilian Tyrant of Syracuse from 270 to 215 BC, and the illegitimate son of a Syracusan noble, Hierocles, who claimed descent from Gelon. He was a former general of Pyrrhus of Epirus and an important figure of the First Punic War. 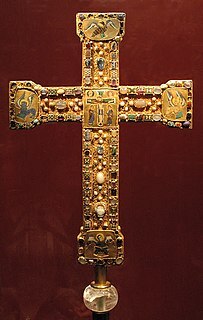 The Treasure of Guarrazar, Guadamur, Province of Toledo, Castile-La Mancha, Spain, is an archeological find composed of twenty-six votive crowns and gold crosses that had originally been offered to the Roman Catholic Church by the Kings of the Visigoths in the seventh century in Hispania, as a gesture of the orthodoxy of their faith and their submission to the ecclesiastical hierarchy. 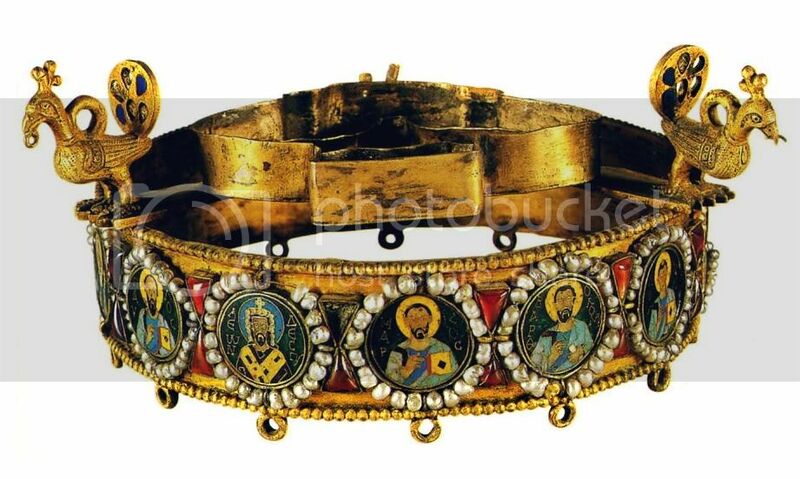 The most valuable of all is the votive crown of king Reccesuinth with its blue sapphires from Sri Lanka and pendilia. Though the treasure is now divided and much has disappeared, it represents the best surviving group of Early Medieval Christian votive offerings. Gregory of Tours was a Gallo-Roman historian and Bishop of Tours, which made him a leading prelate of the area that had been previously referred to as Gaul by the Romans. He was born Georgius Florentius and later added the name Gregorius in honour of his maternal great-grandfather. He is the primary contemporary source for Merovingian history. 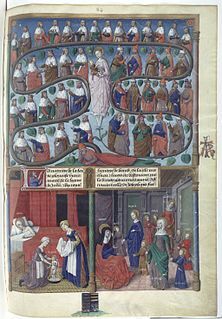 His most notable work was his Decem Libri Historiarum, better known as the Historia Francorum, a title that later chroniclers gave to it, but he is also known for his accounts of the miracles of saints, especially four books of the miracles of Martin of Tours. St. Martin's tomb was a major pilgrimage destination in the 6th century, and St. Gregory's writings had the practical effect of promoting this highly organized devotion. The Iron Crown of Lombardy is both a reliquary and one of the oldest royal insignias of Christendom. It was made in the Early Middle Ages, consisting of a circlet of gold and jewels fitted around a central silver band, which tradition holds to be made of iron beaten out of a nail of the True Cross. The crown became one of the symbols of the Kingdom of the Lombards and later of the medieval Kingdom of Italy. It is kept in the Cathedral of Monza, outside Milan. One of many crowned statues of the Virgin Mary carried in the processions of Holy Week in Seville. In England, a later medieval source says that King Canute gave a, or "his", crown to be placed on or over ("super caput") the head of the rood, or large crucifix, in Winchester Cathedral (other notables decorated statues with their jewellery or a sword). The Anglo-Saxon Chronicle records that Hereward the Wake's men looted a solid gold crown from the head of the rood on the main altar of Peterborough Cathedral in 1070. The Romanesque period saw the height of crowned images of Christ, who is often shown wearing a crown on the cross in wood and metal figures, and manuscript illuminations, and also the introduction of crowned images of the Virgin Mary in the West, as the concept of Mary as Queen of Heaven became increasingly prominent. A rood or rood cross, sometimes known as a triumphal cross, is a cross or crucifix, especially the large Crucifixion set above the entrance to the chancel of a medieval church. Alternatively, it is a large sculpture or painting of the crucifixion of Jesus. A crucifix is an image of Jesus on the cross, as distinct from a bare cross. The representation of Jesus himself on the cross is referred to in English as the corpus. 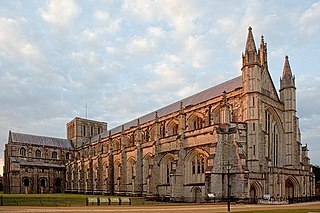 Winchester Cathedral is a cathedral of the Church of England in Winchester, Hampshire, England. It is one of the largest cathedrals in Europe, with the greatest overall length of any Gothic cathedral. Aachen Cathedral, traditionally called in English the Cathedral of Aix-la-Chapelle, is a Roman Catholic church in Aachen, western Germany, and the see of the Roman Catholic Diocese of Aachen. Votive crowns have continued to be produced in Catholic countries in modern times. Often such crowns were kept in the church treasury except for special occasions such as relevant feast-days, when they are worn by the statue. Christ and the Virgin Mary are frequently conventionally shown wearing crowns in Christian art, in subjects such as the Coronation of the Virgin, and are the most common figures to be crowned, but other saints may also be given crowns, especially if the saint was royal, or a martyr, as martyrs are promised crowns in heaven by many texts. ↑ Rossi & Russo, 11-12. Vitruvius text, see sections 9-12. 1 2 Musée de Cluny, webpage with another crown Archived 2010-03-17 at the Wayback Machine ., accessed May 20, 2010 (in French). ↑ Chopin, Danielle Gaborit.Encyclopedia of the Middle Ages "Crown, art", edited by André Vauchez, Richard Barrie Dobson, Michael Lapidge, Volume 1, page 390. ↑ "Image of Leo VI's crown". ↑ Image of Margaret's crown Schitker, 105-111 explores the donation in detail. ↑ Norman, Geraldine, ‘Crowning Glory of the Andes’: The Independent on Sunday, 18 June 1995. The crown was not in fact sold. ↑ Marriage Customs of the World. The medieval art of the Western world covers a vast scope of time and place, over 1000 years of art in Europe, and at times the Middle East and North Africa. It includes major art movements and periods, national and regional art, genres, revivals, the artists' crafts, and the artists themselves. 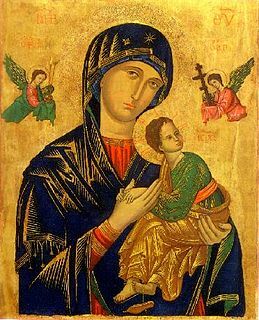 Maestà[maeˈsta], the Italian word for "majesty", designates an iconic formula of the enthroned Madonna with the child Jesus, whether or not accompanied with angels and saints. The Maestà is an extension of the "Seat of Wisdom" theme of the seated "Mary Theotokos", "Mary Mother of God", which is a counterpart to the earlier icon of Christ in Majesty, the enthroned Christ that is familiar in Byzantine Mosaics. Maria Regina is an art historians' synonym for the iconic image of Mary enthroned, with or without the Child. The Tree of Jesse is a depiction in art of the ancestors of Christ, shown in a tree which rises from Jesse of Bethlehem, the father of King David and is the original use of the family tree as a schematic representation of a genealogy. It originates in a passage in the biblical Book of Isaiah which describes metaphorically the descent of the Messiah, and is accepted by Christians as referring to Jesus. The various figures depicted in the lineage of Jesus are drawn from those names listed in the Gospel of Matthew and the Gospel of Luke. Spearhafoc was an eleventh-century Anglo-Saxon artist and Benedictine monk, whose artistic talent was apparently the cause of his rapid elevation to Abbot of Abingdon in 1047–48 and Bishop-Elect of London in 1051. After his consecration as bishop was thwarted, he vanished with the gold and jewels he had been given to make into a crown for King Edward the Confessor, and was never seen again. He was also famous for a miracle which impacted his career. Santa Costanza is a 4th-century church in Rome, Italy, on the Via Nomentana, which runs north-east out of the city. It is a round building with well preserved original layout and mosaics. It has been built adjacent to a horseshoe-shaped church, now in ruins, which has been identified as the initial 4th-century cemeterial basilica of Saint Agnes. Santa Costanza and the old Saint Agnes were both constructed over the earlier catacombs in which Saint Agnes is believed to be buried. The Holy Face of Lucca is a venerated wooden corpus (body) of a crucifix in Lucca, Italy. Medieval legends stated that it had been sculpted by that Nicodemus who assisted Joseph of Arimathea in depositing Christ in the tomb and specifically dated its arrival in Lucca to AD 742. The Coronation of the Virgin or Coronation of Mary is a subject in Christian art, especially popular in Italy in the 13th to 15th centuries, but continuing in popularity until the 18th century and beyond. Christ, sometimes accompanied by God the Father and the Holy Spirit in the form of a dove, places a crown on the head of Mary as Queen of Heaven. In early versions the setting is a Heaven imagined as an earthly court, staffed by saints and angels; in later versions Heaven is more often seen as in the sky, with the figures seated on clouds. The subject is also notable as one where the whole Christian Trinity is often shown together, sometimes in unusual ways. Although crowned Virgins may be seen in Orthodox Christian icons, the coronation by the deity is not. Mary is sometimes shown, in both Eastern and Western Christian art, being crowned by one or two angels, but this is considered a different subject. The Virgin of Mercy is a subject in Christian Art, showing a group of people sheltering for protection under the outspread cloak, or pallium of the Virgin Mary. It was especially popular in Italy from the 13th to 16th centuries, often as a specialised form of votive portrait, and is also found in other countries and later art, especially Catalonia and Latin America. The Bosom of Abraham Trinity, also known as the Trinity with souls, is a rare iconography apparently unique to English medieval alabaster sculpture, of which only twelve examples are known to have survived, although there were undoubtedly many more made. They adapt an earlier convention where a figure of Abraham himself held tiny figures of souls in a cloth between his hands representing the Bosom of Abraham. In ecclesiastical architecture, a ciborium is a canopy or covering supported by columns, freestanding in the sanctuary, that stands over and covers the altar in a basilica or other church. It may also be known by the more general term of baldachin, though ciborium is often considered more correct for examples in churches. Early ciboria had curtains hanging from rods between the columns, so that the altar could be concealed from the congregation at points in the liturgy. Smaller examples may cover other objects in a church. In a very large church, a ciborium is an effective way of visually highlighting the altar, and emphasizing its importance. The altar and ciborium are often set upon a dais to raise it above the floor of the sanctuary. Italy has the richest concentration of Late Antique and medieval mosaics in the world. Although the art style is especially associated with Byzantine art and many Italian mosaics were probably made by imported Greek-speaking artists and craftsmen, there are surprisingly few significant mosaics remaining in the core Byzantine territories. This is especially true before the Byzantine Iconoclasm of the 8th century. Stokstad, Marilyn. Medieval Art, Harper & Row, 1986.